Cooper received an Army commission after attending the University of Hawaii, according to NASA. He then transferred to the Air Force, went on active duty in 1949 and received his wings, then flew with the 86th Fighter Bomber Group in Munich, Germany, for four years. After picking up some advanced training, Cooper then went to the Air Force Experimental Flight Test School at Edwards Air Force Base in California. He graduated in 1957 and then started testing new types of fighter aircraft. Cooper was on his way up in the Air Force, but that career track was interrupted when he was invited to a secret military meeting in Washington, D.C. It turned out to be for NASA's astronaut program — the first applicants were drawn from a pool of test pilots — but nobody outside a small group knew that at the time why the invitation was issued. Astronaut L. Gordon Cooper Jr.,prime pilot for the Mercury-Atlas 9 mission, inside his Mercury spacecraft runs through one of the numerous pre-flight checks surrounded by dials, switches, indicators and buttons. "I was very happy in my job when I was ordered to report to Washington. No explanation or anything," Cooper recalled in a 1998 oral interview with NASA. "In fact, there were three of us from the base that were leaving, that were ordered to report to Washington," he added. "And our commander called us in and said, 'Do you have any idea what this is about?' We said, 'No, sir. We don't.' He said, 'Well, I don't either.' But he said, 'Don't go volunteering for anything foolish." After hearing the initial briefing, however, Cooper was enthusiastic. "I signed up at the end of the day," he said "I did have one or two thoughts about, '[Do] I want to give up the job that I had and go into a new unknown?' I didn’t hesitate very long." The Prime crew for the Gemini 5 space flight complete practice survival training on July 21, 1965.
Cooper had to wait until almost everyone else had flown before he got his chance, but his flight ended up being the longest and last of the Mercury program. 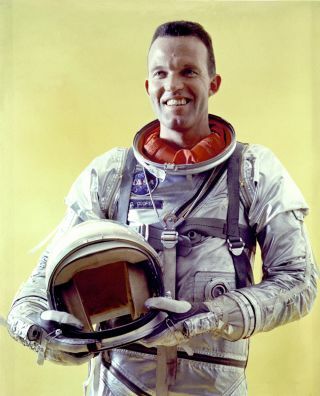 He piloted Faith 7 across 22 orbits solo — the last American government astronaut to fly alone to date — on May 15-16, 1963. The mission lasted nearly 34.5 hours, and focused on making sure that astronauts could work stably in the spacecraft when it was in different modes of operation. Cooper was famously so relaxed before his historical mission that he decided to take a brief nap on the launch pad. "Well, I had my work all done and we had a built-in hold to get the range up to speed," Cooper said in 1998. "I'd already been up several hours, so I thought that would just be a good opportunity to get a little nap." The astronaut returned to space again aboard Gemini 5, which he commanded. This mission — done with Pete Conrad, who later walked on the moon — set a space endurance record of the time of more than eight days, travelling 3.3 million miles in orbits around Earth. The spacecraft experienced several technical problems during the flight, including problems with a fuel cell that put off a planned rendezvous experiment, but the crew returned healthy and with many of their mission objectives accomplished. Gemini 5 also marked a milestone in the space race, as the accumulated time in space for NASA of 225 hours and 15 minutes put the Americans ahead of Soviets in that marker during the space race. Cooper kept involved in the space program after that flight as a backup command pilot for Gemini 12 and also a backup commander for Apollo 10. He retired from NASA and the Air Force in 1970, about midway through the Apollo moon program. After retiring, Cooper was active for many business ventures. Among other things, he designed, raced and built championship boats, consulted for design and construction of car production items for several car companies, and did work on fiberglass structures and aeronautical "lifting bodies." His autobiography, "Leap of Faith," describes his time with NASA and his belief in UFOs. Cooper died at age 77 in October 2004. Some of Cooper's cremated remains were launched into orbit aboard a private spacecraft in 2012.